The Statue of Unity, a tribute to Sardar Vallabhbhai Patel, is 177 feet higher than China's Spring Temple Buddha, which was the tallest statue till now. 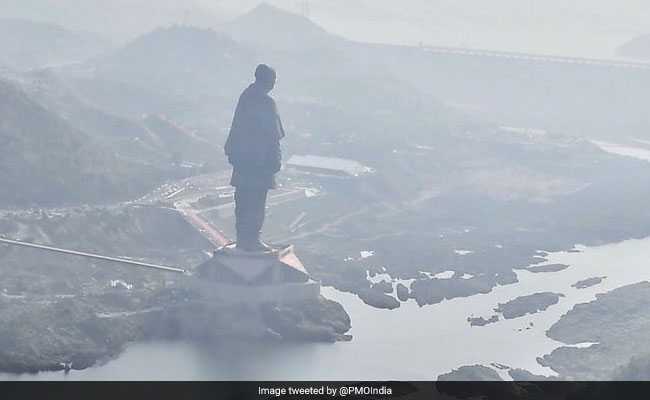 Sardar Patel Statue of Unity: At 597 feet or 182 metres, the statue will be the world's tallest statue. Prime Minister Narendra Modi unveiled the 'Statue of Unity' at Kevadiya in Gujarat today. The 182-metre statue of Vallabhbhai Patel is "dedicated to the nation" on his birth anniversary in Narmada district of Gujarat. At the launch ceremony, the prime minister will pour soil and water from the river Narmada into an urn, a release from his office said. At 597 feet or 182 metres, the Statue of Unity is the world's tallest statue. It is 177 feet higher than China's Spring Temple Buddha, which was the tallest statue till now. It is twice as tall as the Statue of Liberty in New York. The Statue of Unity was built at an estimated cost of Rs 2,989 crore. The viewing gallery, at a height of 193 metres, can accommodate 200 visitors at a time. A museum dedicated to Sardar Patel, at the base of the structure, will have 40,000 documents, 2,000 pictures and a research centre dedicated to Sardar Patel.